The FS-2500 is a remote mounted bypass filtration system. The FS-2500 cleans your oil at an efficiency rate of 1 micron absolute. That means you will dramatically extend oil drain intervals, and most importantly, stop up to 99% of the wear in your engine. So, you’ll save an impressive amount of time and money, staying on the road, in the water or in the field longer. Way longer. There is a lot of marketing hype out there about bypass oil filters. But there is no disputing the fact that, if properly installed and maintained, they work to keep soot, debris and dirt from harming your engine and extending time between oil changes. 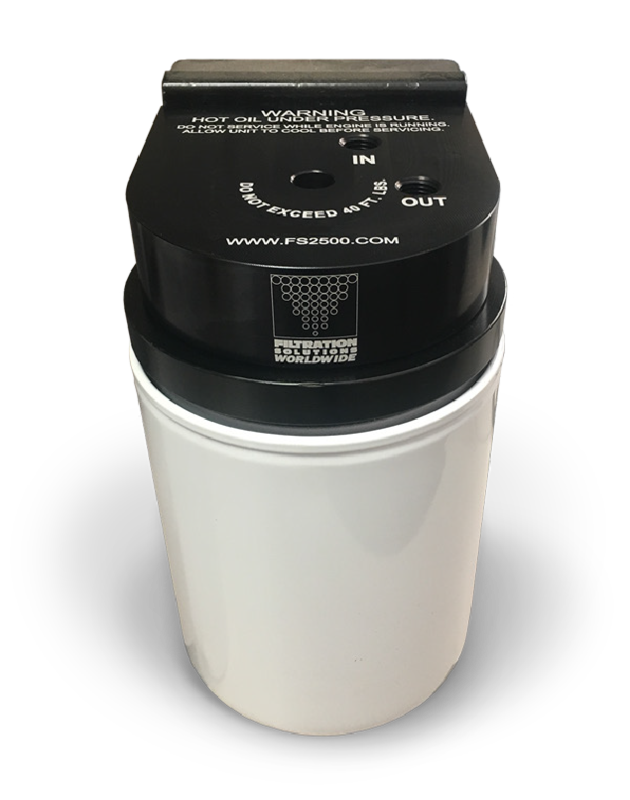 Now, the FS-2500 bypass oil filter is approximately 9 inches tall and 5 inches wide – small enough to fit on any truck frame or in the engine compartment of heavy equipment. It’s also designed to work for automatic transmissions, hydrostatic drives, hydraulic systems and many other applications. Between an oil filter’s small size, pressure differential, flow rate and media pore size, full-flow filters simply can’t filter oil the way it can when combined with the FS-2500 bypass oil filter. Independent research results prove the FS-2500 is 98% efficient at 1 micron. Run the FS-2500 through the hardest test of all – yours.